Proof: The Rise of Printmaking in Southern California | Printmaking had for centuries been explored by painters and sculptors alike--most notably Rembrandt van Rijn, Francisco de Goya y Lucientes and Pablo Picasso--but it was not embraced by the 20th-century American avant-garde, though there were a few exceptions. In 1960, Los Angeles-based artist June Wayne took it upon herself to "create a pool of master artisan-printers in the United States." These words were spoken at the founding of the Tamarind Lithography Workshop in Los Angeles by Wayne, who, through her dedication and hard work, created a workshop that would educate printers, artists, curators and collectors alike. Indeed, Tamarind sparked a renaissance in the graphic arts--a revival that spread well beyond Los Angeles and the medium of lithography. In the next few decades, all methods of printmaking would be established and legitimized as viable and valuable forms of art making. Proof: The Rise of Printmaking in Southern California explores the significance of printmaking and its new possibilities as first re-envisioned in Southern California in the mid-20th century. 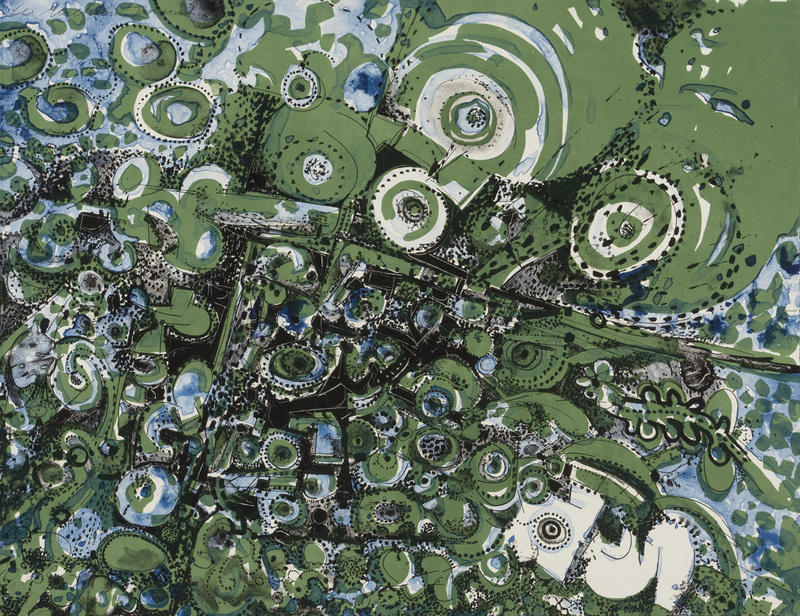 Drawing from the Museum's extensive print collection and a few select loans, the exhibition includes approximately 150 prints, portfolios and multiples, including works by the local founders of the movement, such as John Altoon, Garo Antreasian, Richard Diebenkorn, Sam Francis, Ed Moses, Ken Price, Ed Ruscha and June Wayne. Proof also includes works by a significant number of artists who traveled west to print specifically in Los Angeles, such as Josef Albers, Louise Nevelson, Claes Oldenburg and Robert Rauschenberg. Doinʼ It in Public: Feminism and Art at the Womanʼs Building | This exhibition explores the work and world of feminist artists, art collectives at the Los Angeles Womanʼs Building from 1973-1991. Along with historical ephemera and documentation, the show surveys the work of groundbreaking feminist artists/designers and artist collectives who gathered together at the Los Angeles Womanʼs Building from 1973 through 1991. The exhibitionʼs opening reception and publication launch is expected to draw many of the artists who pioneered the feminist art movement in Los Angeles and beyond. Artist Linda Vallejo will enact a collaborative opening ceremony that recalls the legacy of the Woman's Building community. Vallejoʼs art performance will be followed by The Waitresses, a performance art group formed in 1977 by artists who were also waitresses, as well as graduates of the Feminist Studio Workshop at the Womanʼs Building. And renowned feminist artist and Womanʼs Building co-founder Judy Chicago will make a personal appearance and sign books at the opening reception. Synthetic Ritual | The exhibition examines the presence of ritual and superstition in our professional and personal lives and asks why, in such an advanced and sophisticated technological and cyber driven world, ritual still occupies such an important and dominant role. Exploring the three central themes of ritual in relation to sport, religion, and artistic practice the artists provide refreshing and surprising commentary on ritualized behavior in the 21st century. Elaborate ritualized behavior by sports fans and players dominates the world of sport. Whether it involves wearing the same unwashed jersey throughout the season, sleeping with a baseball bat to overcome a hitting dry spell, boxers drinking blood before a prizefight, repetitive rituals performed by baseball players with their gloves or feet before stepping into the batter's box, fishermen avoiding the path of barefoot women, all of these behaviors are regarded as acceptable decorum; yet when isolated and examined, free from the clutter of a falsely normalizing setting, they are utterly absurd and hardly distinguishable from madness. 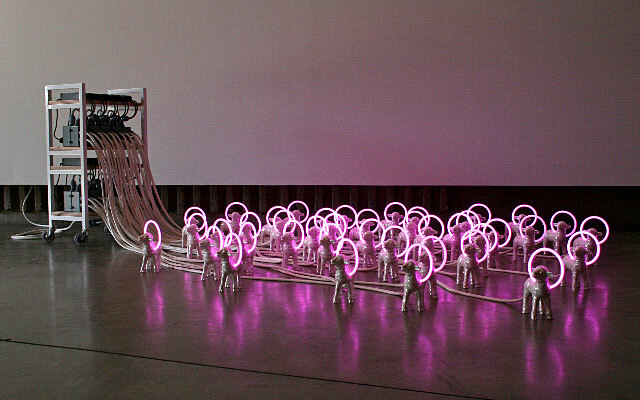 David Adey, Flock, 2010, Ceramic lambs, neon, electronics. Courtesy Luis de Jesus. On view at PULSE Los Angeles. This Week It's All Fair | There's a slew of new fairs in town this week which, coupled with the official launch of Pacific Standard Time, may finally affirm Los Angeles' standing as a world-class contemporary art center. This weekend Downtown Los Angeles will play host to a trio of new art fairs led by Art Platform - Los Angeles, whose parent company produces The Armory Show, Art Chicago, Art Toronto, NEXT, Volta, Volta NY, and now, Art Platform - Los Angeles. Following Art Platform's lead are PULSE and Fountain art fairs, each with roots established in Miami and New York. Each hoping to transplant some of that success in Los Angeles. 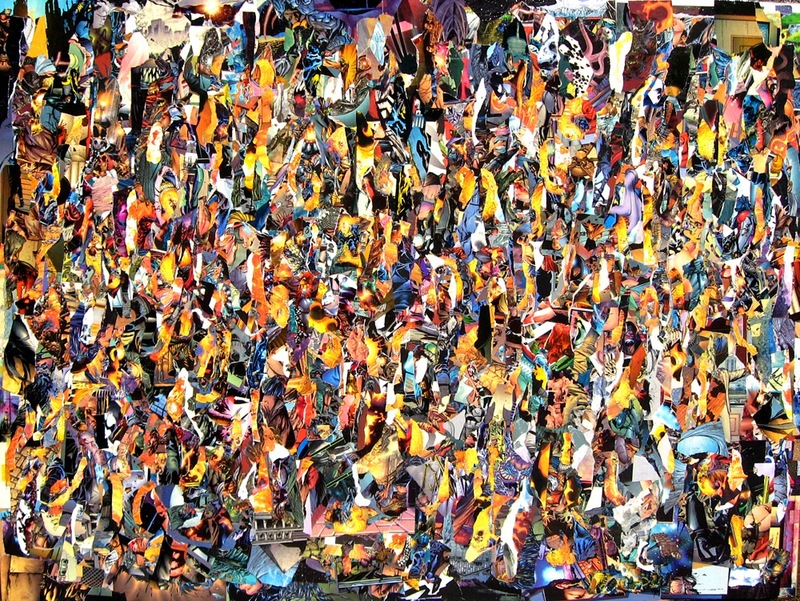 All three fairs offer a unique vibe, with exhibiting galleries hailing from all over the United States (including many from right here in Los Angeles) and the world. 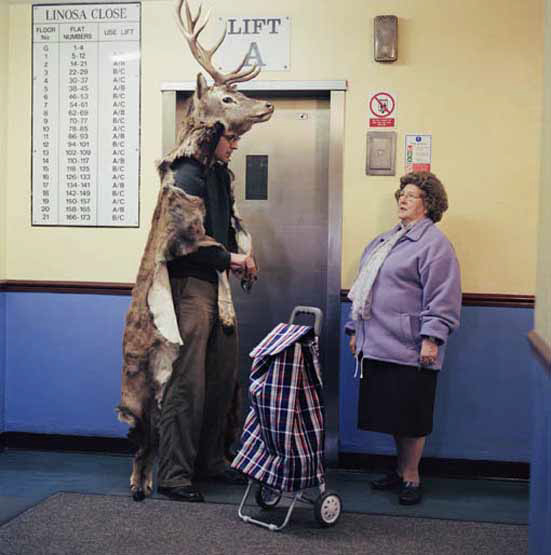 Click here for a detailed overview of each fair with links to tickets. Top 10 Now | While Pacific Standard Time takes a look back at the history of the Los Angeles art scene, Avant-L.A. points us to its future. Top 10 Now, the first in a series of independent curatorial exhibitions by Avant-L.A., will feature the work of today's top 10 independent artists here in Los Angeles. Juxtaposed to the Southern California museum-anchored event Pacific Standard Time: Art in L.A. 1945 - 1980, and the major ancillary contemporary art fairs--Art Platform Los Angeles and Pulse Los Angeles--Avant-L.A. offers an alternative to the post-war perspective of California art the museums and fairs will provide. Rather, Avant L.A. has "identified the 10 most compelling and important established and emerging artists," promises Mat Gleason, curator and co-founder of Avant-L.A., hoping to "complement the experience of attending Platform" which is conveniently located nearby. For more information about art events throughout Los Angeles go to Artweek.LA.